Ankle Injuries in a Slip and Fall Accident: What Kind of Damages Can You Recover in a Florida Slip and Fall Claim? Slip and fall accidents are unpredictable. They can happen at any time, and anywhere (unless, of course, they occur because someone like a business owner acted in a negligent manner – in which case, the accident was predictable or foreseeable). We also, for the most part, can’t control how we fall and if we get injured. However, we do know that the most common injury that results from a slip and fall are those to the ankle. Ankle injuries can be detrimental to a victim both in terms of the time needed to heal as well as in the physical pain and suffering, lost wages, and medical expenses that can occur. 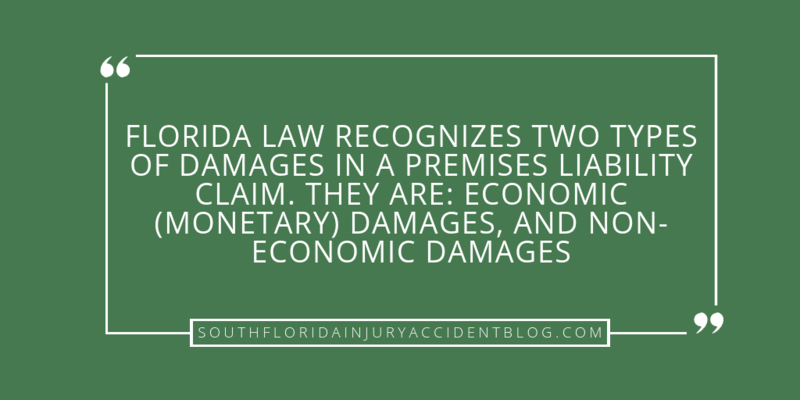 Fortunately, Florida’s premises liability law allows for a victim to recover their damages from a negligent property owner. This law allows a victim to recover damages that can make them whole again. Below is a brief overview of these damages. Technically, your ankle is a complicated group of bones where your two leg bones meet with your ankle bone to form a joint, being your ankle joint. Surrounding and working with these three bones are your muscles, tendons, and ligaments (these are known as soft tissues. Soft tissue injuries can be extremely painful and even permanent – especially where one of these are torn. All these things have to be working properly in order for you to use and move your ankle and foot and leg properly. Not all ankle injuries are the same. In slip and fall accidents, all sorts of injuries to the ankle can happen. Maybe the ligaments are injured: this is considered a sprain. Or perhaps no bones are damaged, but the pain is still severe and the ability to use the ankle is compromised (which could be permanent). Ankle sprains can mean months of recovery time. When bones are broken with no skin penetration, the injury becomes an ankle fracture (a hard tissue injury). Ankle fractures from a slip and fall mean that either the ankle bone and/or one of the lower leg bones that comprise the ankle joint are broken. These can be serious injuries that may take a long time to heal. Ankle injuries can also involve damage to tendons or cartilage (again, soft tissue injuries). Here, bones may or may not be compromised but the things that connect the muscle to the bones (tendons) or the things that cushion the joint from stress (cartilage) are compromised making the ankle joint seriously injured and/or weak. If a victim is able to prove that the property owner or business owner was negligent, by showing the property knew or should have known about the dangerous condition that caused the victim’s ankle injury, then the victim can recover a variety of damages. Florida law recognizes two types of damages in a premises liability claim. They are: economic (monetary) damages, and non-economic damages. Not all ankle injury victims face the same outcomes. It is not just a matter of the different type of injury — break or strain, bone or tendon. There are many other factors that come into play when determining the amount of compensation it will take to make a victim whole. Imagine Joe Fisher, a commercial fisherman who had a good day at the Madri Gras dog track down the street before he slipped and fell on water in the restaurant there and broke his ankle bone. That same afternoon, Jim Lazyboi, a retired stockbroker addicted to stamp collecting slipped and fell on some spilled coffee at the coffee shop and broke his ankle bone when he and his lovely wife stopped for a break while shopping at Hallandale’s famous Fashion Row. Both suffer ankle bone breaks. Both are in their mid-fifties. Both got prompt medical treatment after the managers were called and police reports were made. Both are dealing with the same insurance company who covers both the restaurant and the coffee shop. Their medical needs may not be the same. While both suffered ankle fractures from a slip and fall accident, their bodies are unique. Jim Lazyboi may need different treatment and suffer different kinds of aggravations in healing over the months of recovery than Joe Fisher. Occupation and lifestyle both impact the claim to be made. The consequences of the ankle injury to Mr. Lazyboi with his sedentary lifestyle, as a retiree here in sunny South Florida with a penchant for stamp collecting is very different than an ankle fracture to Mr. Fisher. Mr. Fisher is extremely active physically as a commercial fisherman who makes his living using both his feet all the time as he fights for his catch out in the Atlantic Ocean. Mr. Fisher may have a much more substantial claim because his livelihood has been compromised, short term during recovery and possibly long term if his ankle can no longer be depended upon for a sure footing on a slippery boat. Psychological damage may result, as well, if he suffers from debilitating depression as he is unable to return to the ocean waters and the work he loves. He and his wife and children all suffer in their spousal and familial relationships, too, resulting in damage claims of their own. In addition to lifestyle, age is also an important factor that the jury considers when deciding what damages to award a slip and fall victim. For example, consider an 18 year old who has been playing football his whole life and received a college scholarship for football. If he breaks his ankle in a slip and fall and can no longer play, he is likely entitled to more compensation than an 80 year old retiree who may not be as active. For more, read: Can Age Affect Settlement Of A Personal Injury Claim? Note: Any lawsuit based on negligence must be filed in the appropriate Florida court within four (4) years of the date the incident occurred. A good piece of advice if you have hurt your ankle in a slip and fall caused by the negligence of a third party, is to speak with an experienced personal injury lawyer before you file a claim to learn about some of the issues that can arise with these claims, including the type of evidence needed to prove a claim and the type and amount of damages you can recover. Most personal injury lawyers, like Alan Sackrin, will offer a free initial consultation (over the phone or in person) to answer your questions. Hurt in a Florida Restaurant After Falling Out of the Booth: Do You Have a Claim?